(MP223). Cecil King, RI RBA ROI RSMA (1881-1942). watercolour signed and dated1921. HMS QUEEN ELIZABETH (Captain Geoffrey Blake RN) flagship of the Commander-in-Chief Atlantic Fleet, Admiral Sir Charles Madden Bt GCB GCVO KCMG, would have been on the spring cruise too but has perhaps remained at sea or gone on another port visit, possibly with HMS VALIANT (Captain Cecil Staveley CMG RN) of her squadron, in company. The fifth ship of the class and squadron, HMS MALAYA (Captain Percy Royds CMG RN) was absent in the Far East, on a courtesy visit to her donors in Malaya and. carrying HRH The Duke of Connaught to India enroute. 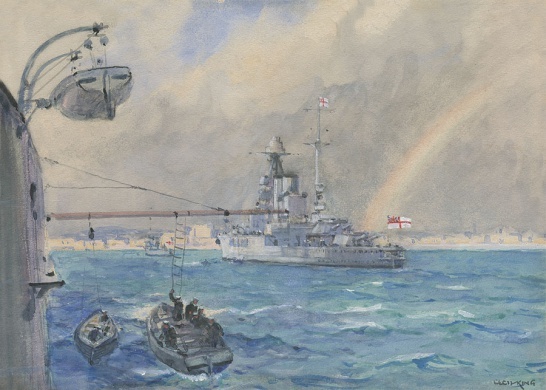 Captain Cecil George Charles King TD painted for the Sphere and Illustrated London News and his sea paintings are represented in the Imperial War Museum, London and in the Paris Musee de Marine. He was vice-president of the Society of Marine Artists and was Marine Painter to the Royal Thames Yacht Club in Knightsbridge. The author of several books about the Royal Navy, he was considered to have “an extensive knowledge of naval lore” (Obituary, The Times, 10 December 1942). He had served in the trenches of World War 1 but the sea was, we are told, his first and abiding love.